Today is the birth anniversary of veteran freedom fighter and the great son of India. Netaji Subhash Chandra Bose, who lived for the country and ultimately laid his life in the struggle to free India from the Colonial rule. 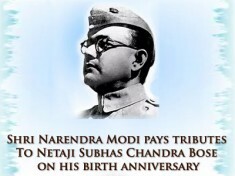 Prime Minister Narendra Modi has paid tributes to Netaji Subhas Chandra Bose, on his birth anniversary. Affectionately called Netaji, Subhas Chandra Bose, was one of the most prominent leaders of Indian freedom struggle. India’s freedom struggle cannot be imagined without remembering the great sacrifice and determination and contribution of Subash Chandra Bose. He founded Indian National Army (Azad Hind Fauj) to overthrow British Empire from India and came to acquire legendary status among Indian masses. Subhas Chandra Bose was born on January 23, 1897 at Oriya bazaar of Cuttack district Orissa. His father Janaki Nath Bose was a famous lawyer and his mother Prabhavati Devi was a devout and religious lady. Unlike other prominent leaders of the Indian freedom struggle, Subhas strongly believed that an armed rebellion was necessary to wrest independence from the British. In 1909 he got admission in Ravenshaw Collegiate School, Cuttack. In 1913, he started his higher secondary educational academic career in Presidency College, Calcutta. On 21st October 1943, Netaji formed the Indian National Army. Netaji Subhas Chandra Bose is remembered for his Salutation and slogan of ‘Jai Hind’. The famous words of Subash Chandra Bose “Give me blood, I will give you freedom” encouraged the freedom fighters. Netaji Arrived Tokyo in May 1943, Bose attracted the attention of the Japanese leadership. The Japanese agreed to cooperate in founding an Indian National Army (INA) in Southeast Asia. Bose was flown to Singapore and became commander of the INA and head of the Free India provisional government. The INA included both Indian prisoners of war from Singapore and Indian civilians in Southeast Asia. The strength of INA grew to 50, 000 and fought Allied forces in 1944 inside the borders of India at Imphal and in Burma. For Bose any means and any ally were acceptable in the struggle to liberate India. By the end of World War II none of Bose’s Axis allies had helped, and Bose then turned to the Soviet Union. On August 18, 1945, it is believed that Bose was en route to the Soviet Union in a Japanese plane when it crashed in Taiwan. However, his death is very controversial and disputed subject due to the lack of evidence and records of his final days. Though Bose couldn’t live to see the dawn of freedom in the country, posthumously he achieved his goal of Indian independence. The life of this great son of India will ever remain the source of inspiration for every countryman. However death of the great leader has always been under shrouds of mystery. It’s been almost seven decades since his alleged death in a plane crash, but the mystery over Netaji Subhash Chandra Bose’s death continues. Netaji Subhas Chandra Bose was one of India’s most prominent nationalist leaders who tried to wrest India’s freedom from the British by forming the Indian Natioanl Army. Bose was reported to have died in a jet crash in Taiwan on Aug 18, 1945. But the absence of credible evidences regarding the incident and claims to his sights have resulted in many conspiracy theories with a large chuck of the people refusing to believe that Netaji indeed lost his life in a plane crash. Theories about his possible survival still have many takers. Till now the Government of India has formed three committees to do inquiry about the reason behind Netaji’s death. In 1956, Shahnawaz committee was formed, in 1970 Khosala Committee and last in 1999 Mukharjee Committee. The Justice Mukherjee Committe, set up in 1999, submitted its report in 2005. The report concluded that Bose did not die in the alleged air crash of 1945 and the ashes at the Renkoji temple are not his ashes. The Government of India rejected the findings of the Commission. Union Minister Vainkaiya Naidu believes that the time has come for the government to declassify the documents related to Netaji’s death. The death of Subhas Chandra Bose remains a mystery. There are many legends about his survival. Some believe him to have lived the life of ‘Gumnami Baba’, in Faizabas. Others believe he breathed his last in a Soviat prison. Declassifying the documents about Netaji’s will go a long way in unraveling the mystery of his death atleast in the public Mind.